A kitchen island is a beautiful addition to an open kitchen! Open kitchens are welcoming kitchens. And we don’t just mean when kitchens are open for food preparation and cooking a delicious meal. Kitchens are and can be meeting places, common areas in your home where your family and guests gather whether or not food is ready. In this blog we’ll tell you about four reasons why you should consider an open kitchen plan. Over the past two decades or so, kitchen islands have become more commonplace. Kitchen islands are highly compatible with plans for open kitchens. They function like a bar, complete with barstools or chairs easily placed around them. What’s the best thing about kitchen islands It’s far easier to taste dishes and pass them around. Multiple kitchen islands can be placed in a single kitchen; this opens up more meeting area space. Everyone can gather in one area, even if the guest room is easily accessible from where the kitchen is. Why bother dividing your kitchen and dining room? Knock down those divider walls and consider putting in a pass-through. Walls and revolving kitchen doors can get in the way and cause accidents; revolving doors are holdovers from older house designs where kitchens and dining rooms were still separated. An open kitchen keeps the kitchen and dining room much closer together. To maximize mingling potential, be sure that your tables and chairs can be shifted aside to be out of the way until you need them again. Open kitchens open up even more with windows around. More natural light can enter the kitchen, accentuating cabinet details and beautify everything in the kitchen. Allowing more natural light also saves on electricity for lighting while you spend time in the kitchen. Of course, this only applies during the daytime. At night, you’re still probably better off using electric lights. Another perk of an open kitchen design is that appliances and cabinets can be combined together on one wall, freeing up more space in the kitchen. 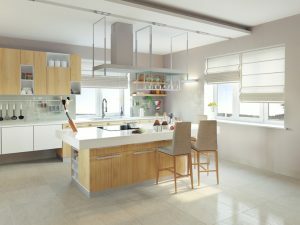 Dining rooms and living rooms can also be connected to the kitchen in this way. This entry was posted on Thursday, February 16th, 2017 at 12:35 pm. Both comments and pings are currently closed.